Size: Various, See Product Options below. Bubblesorption are unique sound absorbing shapes for walls supplied in a variety of colours. These can be used to create a visually pleasing appearance that will brighten any wall as well as being a more decorative solution to reduce reverberated noise within a room. Absorbs large amounts of sound. Made with non-flammable foam and fire retardant fabric. A wide range of fabric colours to choose from. Has a new innovative look. Bubblesorption is an exciting new sound absorbing panel designed to reduce reflected noise (reverberation) in enclosed spaces such as restaurants, reception areas, showrooms and any space that has predominantly hard surfaces. Reflected noise in these areas distort speech and make it difficult to hear when others are speaking to you and is a particular problem in some restaurants and areas where groups of people can congregate. 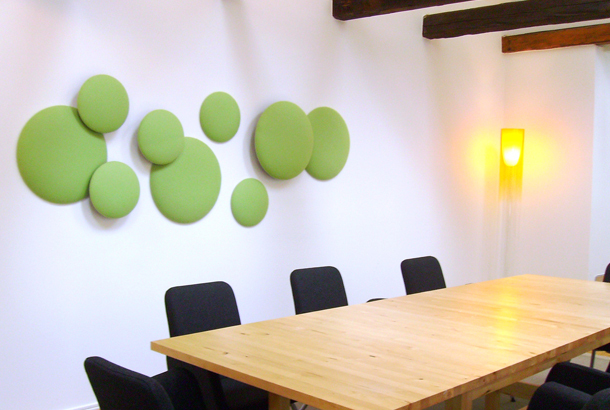 This new sound absorber is designed to look like bubbles and will enhance any wall with its attractive new look as well as making an area more comfortable on the ear and easier to work in. 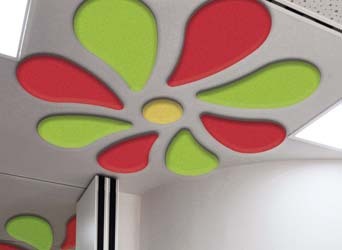 Bubblesorption designer sound absorbing panels can be used to create interesting and artistic designs. The various shapes we offer can be used to create a large number of different designs and patterns using combinations of colours. Soft shapes or more graphical panels can be used to create a unique and interesting space that is comfortable and pleasing to the eye. The panels can be easily resited if required and can be reused if required.